This page contains samples of some images I have created using a Canon EOS Rebel T2i (EOS 550D). I needed a place to put the resulting pictures so that I can share these with friends and family. The rest of the world is welcome too. These are not the original images, but are scaled and/or cropped versions of the originals. If you are interested in seeing the original images, please contact me (jeffb@wolfram.com). Images marked MACRO were taken with a Canon EF 50mm f/2.5 Compact -macro lens. Images marked ZOOM were taken with a Canon EF-S 18-55mm f/3.5-5.6 IS lens. 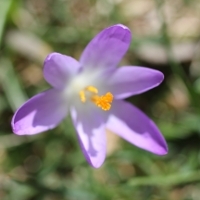 This image of a purple crocus was taken on March 18, 2011 using a Canon EF 50mm f/2.5 Compact-macro lens. This image of wild grass and a spider web was taken on March 18, 2011 using a Canon EF 50mm f/2.5 Compact-macro lens. This image of a snowdrop flower was taken on March 18, 2011 using a Canon EF 50mm f/2.5 Compact-macro lens. This image of a Hyacinth flower stalk emerging from dormancy was taken on March 18, 2011 using a Canon EF 50mm f/2.5 Compact-macro lens. This image of some Pulmonaria (a.k.a. lungwort) flower buds emerging was taken on March 18, 2011 using a Canon EF 50mm f/2.5 Compact-macro lens. This image of a Siberian squill flower bud emerging was taken on March 18, 2011 using a Canon EF 50mm f/2.5 Compact-macro lens. This image of a Siberian squill flower, fully opened, was taken on March 20, 2011 using a Canon EF 50mm f/2.5 Compact-macro lens. This image of our skiddish cat, Sabel, was taken on March 18, 2011 using a Canon EF 50mm f/2.5 Compact-macro lens. This image of Orion's Belt region is a stack of five 20-second exposures and is annotated. Clouds were common and were lit up by light pollution from Champaign. It was taken on March 20, 2011 using a Canon EF-S 18-55mm f/3.5-5.6 IS lens. This is an image of some very young fern fronds. Leaf structure hard to make out and the surface is very shiny. It was taken on March 24, 2011 using a Canon EF 50mm f/2.5 Compact-macro lens. This is an image of a set of fern fronds further along. The leaf structure is a little more evident. It was taken on March 24, 2011 using a Canon EF 50mm f/2.5 Compact-macro lens. This image of a purple hyacinth flower emerging. It was taken on March 24, 2011 using a Canon EF 50mm f/2.5 Compact-macro lens. This image of an emerging pink hyacinth flower. It was taken on March 24, 2011 using a Canon EF 50mm f/2.5 Compact-macro lens. This image of a cluster of purple squill. It was taken on March 24, 2011 using a Canon EF 50mm f/2.5 Compact-macro lens. This is an image of a second cluster of purple squill. It was taken on March 24, 2011 using a Canon EF 50mm f/2.5 Compact-macro lens. This image of a cluster of white squill. It was taken on March 24, 2011 using a Canon EF 50mm f/2.5 Compact-macro lens. Another shot of a cluster of white squill. It was taken on March 24, 2011 using a Canon EF 50mm f/2.5 Compact-macro lens. Image of a yellow daffodil preparing to bloom. It was taken on March 24, 2011 using using a Canon EF 50mm f/2.5 Compact-macro lens. Image of a blue hyacinth just opened. It was taken on March 30, 2011 using using a Canon EF 50mm f/2.5 Compact-macro lens. Image of a pink hyacinth just opened. It was taken on March 30, 2011 using using a Canon EF 50mm f/2.5 Compact-macro lens. Image of a yellow daffodil just opened. It was taken on March 30, 2011 using using a Canon EF 50mm f/2.5 Compact-macro lens. Image of a white hyacinth just opened. It was taken on March 30, 2011 using using a Canon EF 50mm f/2.5 Compact-macro lens. Image of a pink hyacinth up-close. It was taken on March 30, 2011 using using a Canon EF 50mm f/2.5 Compact-macro lens. Image of a patch of young lamium with a young fly. It was taken on March 30, 2011 using using a Canon EF 50mm f/2.5 Compact-macro lens. Image of the first set of flowers on pulmonaria (a.k.a lungwort). It was taken on April 6, 2011 using using a Canon EF 50mm f/2.5 Compact-macro lens. Image of a blue hyacinth during peak bloom. It was taken on April 6, 2011 using using a Canon EF 50mm f/2.5 Compact-macro lens. Image of a pink hyacinth during peak bloom. It was taken on April 6, 2011 using using a Canon EF 50mm f/2.5 Compact-macro lens. This image of a Sweet William (a.k.a. Dianthus barbatus) flower was taken on May 16, 2011 using a Canon EF 50mm f/2.5 Compact-macro lens. This image of a pink trailing soapwort and orange Siberian wallflower was taken on May 3, 2011 using a Canon EF 50mm f/2.5 Compact-macro lens. This image of a pink trailing soapwort flowers was taken on May 11, 2011 using a Canon EF 50mm f/2.5 Compact-macro lens. This image of a Clematis flower was taken on May 12, 2011 using a Canon EF 50mm f/2.5 Compact-macro lens. This image of a Japenese painted fern front against a bed of Lamium was taken on May 11, 2011 using a Canon EF 50mm f/2.5 Compact-macro lens. This image of a blue flax flower was taken on May 3, 2011 using a Canon EF 50mm f/2.5 Compact-macro lens. This image of a Centaurea montana flower was taken on May 9, 2011 using a Canon EF 50mm f/2.5 Compact-macro lens. This image of a Columbine flower was taken on May 13, 2011 using a Canon EF 50mm f/2.5 Compact-macro lens. This image of a Honeysuckle flower cluster blooming was taken on May 11, 2011 using a Canon EF 50mm f/2.5 Compact-macro lens. This image of a bearded iris flower was taken on May 14, 2011 using a Canon EF 50mm f/2.5 Compact-macro lens. This image of wild Columbine flowers was taken on May 11, 2011 using a Canon EF 50mm f/2.5 Compact-macro lens. This image of a tree peony flower was taken on May 8, 2011 using a Canon EF 50mm f/2.5 Compact-macro lens. This closeup image of a tree peony flower was taken on May 8, 2011 using a Canon EF 50mm f/2.5 Compact-macro lens. This image of storm clouds was taken on May 7, 2011 using a Canon EF 50mm f/2.5 Compact-macro lens. This image of sunset after a storm was taken on May 7, 2011 using a Canon EF 50mm f/2.5 Compact-macro lens. This image of Grackles under our bird feeder taken through the back window was taken on May 16, 2011 using a Canon EF 50mm f/2.5 Compact-macro lens. This image of a house finch pair on our bird feeder through our back window was taken on May 16, 2011 using a Canon EF 50mm f/2.5 Compact-macro lens. This image of an Indigo bunting on our bird feeder through our back window was taken on May 16, 2011 using a Canon EF 50mm f/2.5 Compact-macro lens. This image of a yellow finch on our bird feeder through our back window was taken on May 16, 2011 using a Canon EF 50mm f/2.5 Compact-macro lens. This second image of a yellow finch on our bird feeder through our back window was taken on May 16, 2011 using a Canon EF 50mm f/2.5 Compact-macro lens. This image of a spiderwort flower was taken on May 18, 2011 using a Canon EF 50mm f/2.5 Compact-macro lens. This image of an white crowned sparrow was taken on February 25, 2012 from SW Champaign, IL. This image of a meadow fritillary butterfly was taken on April 7, 2012 from Anderson, IN. This image of a farm at sunset was taken on September 22, 2012 from SW Champaign, IL. This image of a pink thistle flower was taken on September 29, 2012 near Foosland, IL. This image of our cat, Remmington, was taken on November 4, 2012 in SW Champaign. This image of a wild mink was taken on November 4, 2012 in Meadowbrook Park, Urbana. This image of a coyote was taken on December 31, 2012 in Meadowbrook Park, Urbana. This image of a deer family was taken on January 1, 2013 in Meadowbrook Park, Urbana. This image of a 12 point buck at sunset was taken on January 1, 2013 in Meadowbrook Park, Urbana. This image of a 12 point buck was taken on January 12, 2013 in Meadowbrook Park, Urbana. This image of an open mouthed buck was taken on January 12, 2013 in Meadowbrook Park, Urbana. This image of a baby tree frog was taken on June 9, 2013 in Fox Ridge State Park, IL. This image of a hackberry emperor was taken on June 9, 2013 in Fox Ridge State Park, IL. This image of a flower spider was taken on June 18, 2013 in SW Champaign, IL. This image of wood ducks was taken on October 5, 2013 in Shadyside Park, Anderson, IN.